UPDATED 3:25 PM: Added just-released letter to parents. UPDATED 4:02 PM: Added statement from CPS spokesperson. 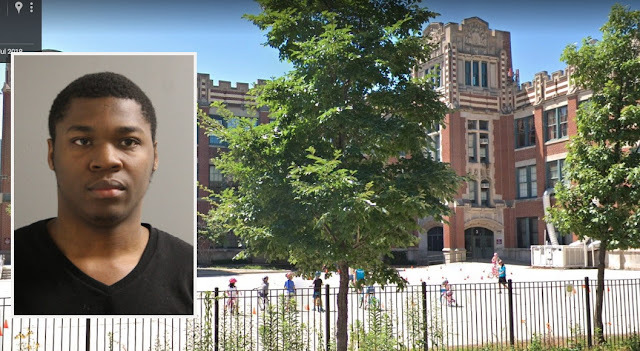 A male worker at Alexander Graham Bell Elementary School, 3730 North Oakley, has been charged with repeatedly sexually abusing a 12-year-old female student at the North Center campus last month, according to Chicago police and court records. The girl told a school staff member that 22-year-old Quinten Hawthorne pinned her against the wall and rubbed his body against her on several occasions between Nov. 7th and Nov. 21st, a Chicago police spokesperson said today. A Chicago Police Department report was filed in the case on Nov. 27th. Hawthorne was arrested yesterday and has been charged with felony aggravated sexual abuse of a victim under age 13 and felony sexual exploitation of a child. Judge Michael Clancy set his bail at $50,000, meaning that Hawthorne can go free by making a bond deposit of $5,000. Hawthorne has no previous criminal record in Cook County, according to court records. A CPS spokesperson said Hawthorne worked for Right At School, a vendor that provides after-school and recess monitoring services at Bell. “Immediately after learning of the allegations, CPS banned Hawthorne from the school and initiated an investigation,” the spokesperson said. "Nothing is more important to CPS than the safety of its students, and immediately after learning of these allegations the district removed the vendor employee from the school, initiated an investigation, and began coordinating supports for the affected student through the district's new Office of Student Protections and Title IX,” said Michael Passman, CPS’ Chief Communications Officer. The safety of your children is always our top priority, which is why we are notifying you of a situation involving a vendor employee who previously served in our school. In late November, Quinten Hawthorne, an employee of a vendor that provides after-school and recess monitoring services at our school, was accused of inappropriate behavior involving a student. As soon as we learned of these allegations, Mr. Hawthorne was banned from the school and an investigation was initiated. Parents of the student who was affected have been notified, and our school has worked with the CPS Office of Student Protections and Title IX to coordinate supports for the student. Since that time, Mr. Hawthorne has been arrested and criminally charged related to the allegations at our school. We take these matters very seriously and remain committed to providing your children with a safe, positive learning environment where they can reach their full potential. We invite you to contact the school directly with any questions or concerns you may have. I am writing to follow up on the letter you received today from Principal Miller regarding a serious allegation against one of our former staff members. Just before Thanksgiving, a former Right at School employee at Bell was accused of inappropriate behavior involving a student. After learning of this accusation, we immediately put the employee on administrative leave and removed him from our program; when that accusation resulted in charges against that employee in court today, we fired him. There is nothing more important to every single Right at School staff member than the safety of your children. This former employee’s alleged actions in no way reflect our commitment to safety or the hard work and dedication that our employees bring to their jobs every day. All educators successfully complete comprehensive criminal-background checks, including fingerprint-based checks through the Illinois State Police and FBI. All educators are trained on our policies and procedures for student safety. We continue to cooperate fully with the Chicago Public Schools and the Chicago Police Department. Regional Director Carrie Kruzycki and Area Manager Abby Cohen will be at our after-school program when school resumes on January 7 to answer any questions that you have. If you would like to reach one of them in the meantime, please contact Carrie Kruzycki at [deleted].